The mid-height upper made from durable premium quality split leather provides more ankle support and protection than a low-cut shoe. The highly adjustable lace closure extends close to the toe for a really secure fit and is lined with the exceptionally breathable Moisture-Tech® waterproof lining from Sympatex®. A very generous protective rubber rand around the forefoot guards against scuffs and abrasion. Unlike lesser approach shoes the Drom boasts a fully board-lasted construction with a full-length midsole giving it excellent underfoot support on rough terrain. 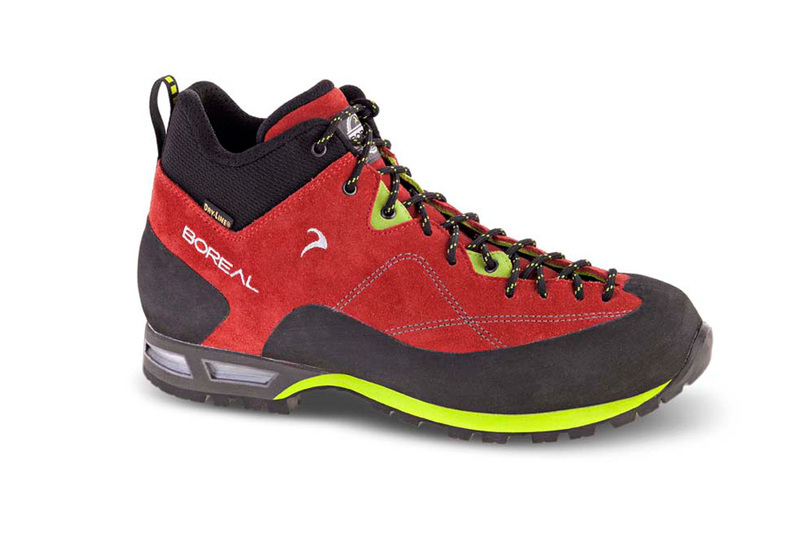 This midsole has a soft EVA top surface layer which greatly enhances underfoot comfort on long hikes. A great mountain approach shoe needs a great outsole and for Drom we chose the Vibram® Pepe rubber outsole which has an aggressive deeply lugged tread pattern for excellent traction on soft and loose surfaces and weight saving cut-outs to shave away any excess weight. Light weight yet rugged, Drom Mid is a perfect footwear choice for mountain approaches, scrambling, Via Ferrata and trail walking.